Lucien Rosengart (1881-1976) was a highly successful inventor and industrialist. However, when he came to making cars, he left the inventing to others. He started off in 1927 by licensing the Austin Seven, the most successful contemporary British small car, also licensed in the US (Bantam) and Germany (Dixi / BMW). Prices and build quality were low, but sales were brisk. In 1930, Rosengart introduced the LR6, the world’s smallest (1097cc!) straight-six. It did not sell well, but the Austin clone LR2 was still going strong. Visiting Germany in 1931, Lucien Rosengart was amazed by the new FWD Adler Trumpf. He took one home and showed it to his friend André Citroën, who is also impressed. Citroën decided his next model would include FWD, along with other wild ideas. Rosengart preferred to acquire the Adler license and introduced the Rosengart LR 500 Supertraction in December 1932. Despite updating his cars’ looks, Rosengart’s range-topping FWD was not a sales success. 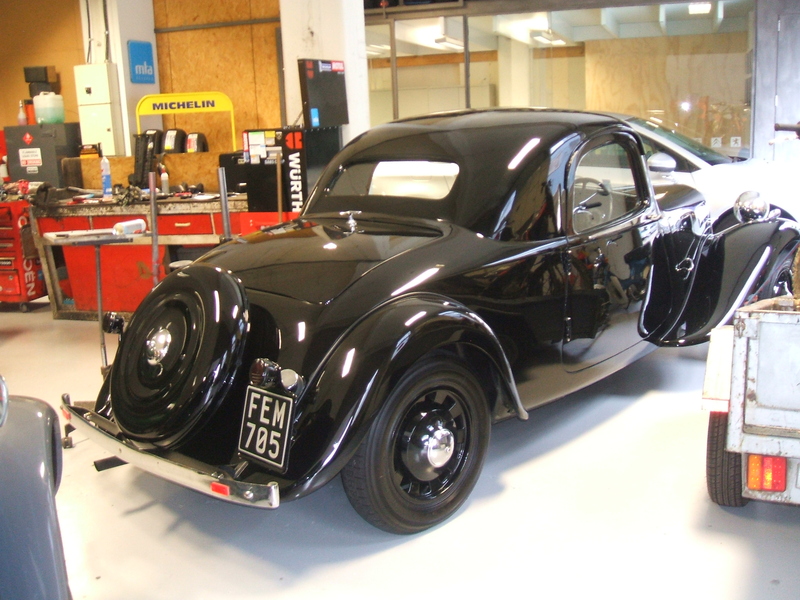 By 1938, Rosengart sought to revamp the Supertraction by asking Citroën for the Traction Avant’s 2-litre OHV engine, drivetrain and hydraulic brakes, while keeping the Adler independent rear suspension. Citroën obliged, on the condition that Rosengart’s car would not be sold as a four-door. It was back to the drawing board: the new car had to be a style leader. By March 1939, the reskinned production car was ready. The Citroën engine had gained 10 hp in the interim – a happy coincidence. The looks of the car drew favourable comparisons to American Fords and Lincolns. Most Supertractions (about 1100 units) were built in the spring and summer of 1939; a trickle were made until early 1940. The convertible was the most popular, making this coupé even more of a rarity. The detailing on these was pretty amazing: door handles that echoed the chrome hood flaps, ultra-thin B posts for a hardtop look and a Darrin-like swoop for striking two-tone paintwork (a popular option that this car lacks). This coupé sports a “base” colour scheme: black or this garnet red were available on closed cars. Other options included a wireless set, lightweight wheels and leather seats. The dash included some Citroën parts, such as the dial and gear lever, but overall it emulated contemporary American designs. All this plus the body-on-frame construction translated into added costs (not a big problem) and extra weight (more of an issue). The Supertraction’s most direct competitor was the Citroën 11CV roadster (there was no coupé for 1939). It was cheaper and quicker than the Rosengart with the same engine, but its 1934 styling was already dated, which counts for a lot in open-top cars. Rosengarts became the darling of the concours d’élégance in the summer of 1939. Production was just ramping up when France and Britain declared war on Germany, on September 3rd. Despite his promise to Citroën, Lucien Rosengart did build a four-door on a stretched LR 539 chassis in late 1939 for his own use. The car was seen and admired in Paris; a few French ministers asked Rosengart for one. Only Rosengart’s car survived. After the war, Citroën were unwilling to provide their engines anymore. Rosengart found an unlikely replacement in the 3.9 litre Mercury flathead V8. Re-dubbed “SupertraHuit” and slightly facelifted, the thirsty and expensive V8 Rosengart was out of step with the times. A handful were made until 1948. The ageing factory was now only kept afloat thanks to various subcontracting jobs. The Rosengart Ariette (1951-53) was produced as a 2-door sedan, convertible and wagon. Lucien Rosengart retired and sold his company to a group of investors, who decided to resurrect the Austin Seven-based small cars that had been so popular 20 years prior. After two false starts, Rosengart completely redesigned the body, producing the Ariette. The engine and chassis were a ‘20s design trying to compete with Renault’s 4CV, Citroën’s 2CV and Panhard’s Dyna. Rosengart attempted to modernize the Ariette with a new engine and a facelift, but it was, as the cliché goes, too little too late. The factory closed in 1954. The Supertraction LR 539 can be seen as the pinnacle of Rosengart’s 25-year history. About 100 have survived, thanks to their great looks and their well-known mechanicals. The US and a lot of the world had a depression Germany had a bold new manager who restructured their currency and suffered a boom from 34 onwards. Riiiiiight. Nothing like confiscating assets, jailing dissenters and invading neighboring countries to put the economy straight, is there? To be fair, he never suggested that didn’t happen or said anything else positive about Hitler. The 1930s were the most innovative decade in the history of the car. It started the decade as a generally conservative thing, largely just an evolution of the seminal 1901 Mercedes. By the end of the decade, it had been completely re-envisioned, in a multitude of radical new designs, technology, etc.. The Depression may well have spurred all the changes rather than retarded them. Folks were more open to new ways of doing things because of the recession, and the radical change in cars, along with so many aspects of design, technology, fashion, etc., were in part because society wanted to envision a new world, better because of radical new designs and applications. Monday morning rarity indeed…yet another French car I’d never heard of, and a good-looking one to boot. +1. Fantastic feature. I knew about Rosengart’s tie-up with the Austin Seven, but didn’t know what happened afterwards. Beautiful car. All of the Rosengart ads show unhappy women driving the car. Getting the woman to drive is good marketing, since the wife usually chooses the car; but showing them as disgruntled drivers spoiled the pitch. Good point, yet I’m not so sure about that. I’m by no means a specialist, but I think that since cars in the pre-war era were mostly male territory (in France anyway), any ad picturing a woman behind the wheel had to give her a serious, no-nonsense look (as opposed to ads about, say, kitchen appliances or washing powder, where the housewife inevitably had an extatic smile on her face). Only after WWII did car ads begin to portray women, couples or whole families where everyone from Grandpa to Junior and even the dog sported that great wide commercial grin we’ve grown totally accustomed to today. I wonder if the engine transplant to the flathead V8 lead to any torque steer, or just understeer from the extra weight. keep in mind that the engine sat well behind the front axle line in these, so weight distribution was not as serious as a problem as you might imagine. It was a Front Mid Engine, technically. All new to me, as well. The interior sports a beautiful instrument panel. There is nothing like the more stylish interiors of the 1930s. That steering wheel and dash are just stunning. Lovely car, new to me…a treat! The 30’s really were an era of strikingly beautiful designs. The details on this one are top-notch and the shape is attractive in its own right, plus that dash is very elegant. And all this from a manufacturer I’d never even heard of! If only the Maginot line wasn’t fixed fortifications. That, and the Ardennes problem. As for the sour-puss expressions on the women, many old-time photos featured a stern look, whether male or female. “Créée” is the only word I know of in a western European language with 3 successive instances of the same letter. The first E is part of the root of “créer,” to create. The second E is equivalent to the “-ed” ending in English. The third E makes it feminine because it’s referring to “voiture,” a feminine noun in French. A 1.1-liter six, wow! I bet it was smooth. Wolseley and MG (same basic engine) also did a 1.1 litre six, but IIRC it was a year or two later. I had thought tiny sixes were a British specialty. In the ’90s Mazda offered a 1.8-liter V6 which I think still stands as the smallest modern six. The Mitsubishi 6A10 V6 was even smaller, with 1597cc. It was the smallest version of their 6A1 V6 family, and the 1.6 L version was built between 1992 and 1998, and used in the Mirage and Lancer. Certainly not in the US; maybe Japan only? Or other markets? But small inline sixes were not that uncommon in Europe back in the day. And the first Ferrari V12 had 1.5 liters. The Triumph Vitesse had a straight 6 of 1596cc in 1962-66. Unusual car, Citroens of that era are rare anyway but this two door effort must take the cake, the personal four door version also uses Citroen TA wheels or at least the same wheels as the 38 Citroen coupe I saw last week, itself quite a rarity. That’s a beut, Bryce. Last year for the TA coupe. Those wheels are Michelin “Pilote” wheels — lighter than many standard wheels at the time, but also a little less sturdy, unfortunately… Peugeot also used those in the late ’30s. Michelin stopped making those not long after the end of WW2. Great piece. Good looking car. I had never heard of Rosengarts, or the Adler Trumf for that matter. If I just saw the photo, I would’ve guessed that it’s the World’s most customized Plymouth! This car would look so much better with curved glass. It’s still nice the way it is though. First time I’ve heard of it. Splendid car, and some interesting new details I hadn’t read (or seen) before. Did not know about the V8 version. Or the Ariette. Yet another reader who never heard of it, but that Supertraction is a knockout .I just love that l chrome trim piece on the side of the hood, and that very art deco dash too. C`est magnifique. I agree with others that the details are beautiful, but it’s interesting to me that people bought these because the Citroen was seen as dated or less stylish. From my perspective the Citroen looks more modern – it’s clean and sleek, the Rosengart is fussy and frumpy. I think that prow makes it look more modern than the upright-grilled Citroen. Love the Art Deco detailing, especially on the dash and steering wheel. I’d heard of Rosengart but have never seen this gorgeous series, thanks for the great article, rounds out more of my automotive knowledge. Apart from the grill and lights, the LR539 looks remarkably similar to a number of premium post-war British cars. I presume this is where they got their inspiration. The French really did make some very stylish cars between the wars. FYI – I saw a Tatra 87 on the road this morning, going the wrong (other) way and with no chance of a camera shot. What a sight! Was it driven by a unicorn? That was pretty much my reaction as well! Interesting story of a car with some wonderful style details. To me, that glasshouse looks a bit 1930s Benz, but works well with the bolder front. Also, the link between the Adler and the Citroen is one I’d like to explore more. Lucien Rosengart and Andre Citroen were close friends. Rosengart had worked at Citroen in the early ’20s and even bailed him out with a short-term loan when Citroen found himself in financial difficulties (he couldn’t pay his employees!) in 1933. He called in that favour for the Supertraction in ’38, asking Michelin for the use of the Citroen engine — Michelin agreed to this, as they were providing Traction engines to Licorne, DB, Chenard-Walcker and Georges Irat already by that point, so one more wouldn’t make much difference. Does anyone know what designer penned this marvelous styling? And what company did the coachbuilding? The Supertraction was designed in-house by Rosengart’s stylist, a Mr Jacob (I cannot find the man’s first name!) and built by Rosengart in their factory,which was Boulevard de Dixmude, Neuilly, just outside Paris. Tatra87, Thank you. Is Mr. Jacob known for any other automotive designs other than this one? pretty much all new to me too – and I agree with those who say 30-39 produced some truly wonderful cars. The V8 model – there can’t be many fwd V8s around this time – what were the others? Anyone know? Is a Cord or Auburn V8? – Derby L8 (1933-36) with a 2 litre V8. Limited production, but a few have survived. – Citroen 22 CV (1934) — a dozen pre-production models made & presented to the public, all disappeared; 3.8 Citroen V8, some tested with Ford V8s. – Cord 810/812 (1936-37) used a 4.7 Lycoming V8 (but earlier Cord L29s had a straight 8). – Claveau Descartes (1948) prototype with a 2.3 V8. – Rosengart SupertraHuit (1946-48) with the 3.9 Mercury flathead — prob. ten made, only one known to exist today. Can’t think of any more. Nothing in the ’50s… ? Honourable mention: the Bucciali TAV8-32, which was a FWD V12. Bucciali also presented a FWD V16 prototype, as well as FWD straight six and eight cars in the late ’20s-early ’30s, but no V8. you have improved my world with that – to think that their are two epic fwd cars called 8something32! Quite like the Rosengart Ariette a pity though the company never developed a modern engine to replace the old 747cc Austin 7 Sidevalve unit. In reality Rosengart could have benefited from appropriating tooling, mechanicals and other technology from the various German marques as war reparations at virtually no cost. They could replaced their old engine with an updated OHV unit derived from the pre-war BMW 3/20 (and potentially capable of further enlargement / power), which was used the same tooling as the Austin Seven Sidevalve engine. They could have even used Flat-Twins derived from either BMW designs – like French motorcycle manufacturer CEMEC or Volkswagen – basically half a Beetle Flat-Four planned for use in the Volkspflug Tractor (also known as the Porsche Typ 110) and later explored in the Volkswagen EA48 prototype (along with Brazilian carmaker Gurgel).